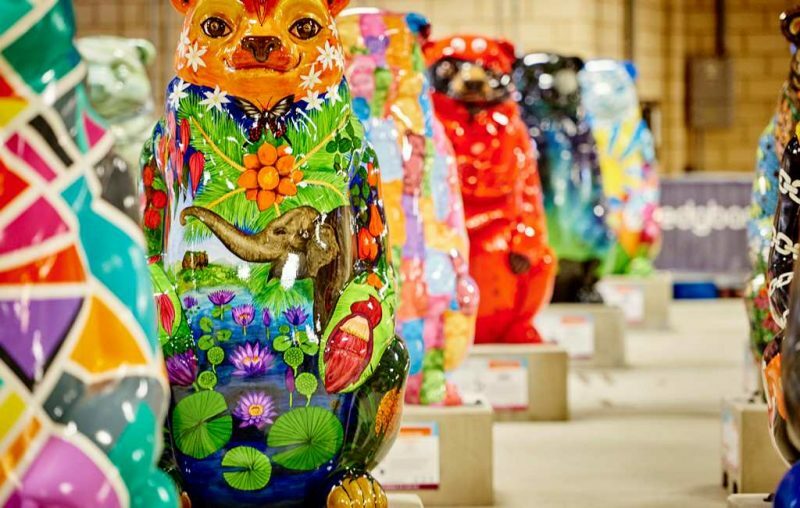 After months of keeping quiet behind the scenes, Birmingham Children’s Hospital Charity and Wild in Art are excited to announce that over 230 beautifully decorated sun bear sculptures are ‘pre-bearing’ to prowl on to the streets, parks and open places of Birmingham for the region’s largest ever free public art trail, The Big Sleuth. For 10 weeks this summer, the sleuths of colourful 5ft-tall bears and 3ft-tall bear cubs will inhabit Bear-mingham and its surrounding areas Solihull, Sutton Coldfield, Sandwell and at Resorts World from Monday, 10 July. The Big Sleuth, so called because ‘sleuth’ is the name of a group of bears, as well as a detective, unites 100 bears individually created by artists, with 137 bear cubs designed as part of The Big Sleuth Learning Programme. Each striking sun bear on the trail tells a different story including designs from celebrities and artists, such as the very well respected artists Temper and Reuben Colley, pop-rock band star Bradley Simpson from The Vamps, actor Adil Ray A.K.A Citizen Khan, Birmingham Bears and England cricketer Chris Woakes, adventurer Bear Grylls, and a special Peaky Blinders bear endorsed by the show’s writer Steven Knight. The trail will attract thousands of residents and tourists to the region, inspiring civic pride and the opportunity for people to spend time together and get active whether it is walking, running or cycling. At the end of the trail, the large bears together with the special celebrity bear cubs will be auctioned off in October to raise vital funds for Birmingham Children’s Hospital Charity. The Big Sleuth’s predecessor, The Big Hoot, raised over £500,000 for the charity at auction, and The Big Sleuth aims to do the same. All proceeds will go towards helping the children and young people treated at Birmingham Children’s Hospital. You can support the hospital by texting SLEUTH to 70007 to make a one off £3 donation or download The Big Sleuth app to kick start your fundraising and track your trail, collect bears and unlock rewards.